Here’s a checklist that you should run through before any consulting interview. 80% of the advice applies across industries and job functions as well. Happy reading! Get your hands on as many different cases as you can – both books like Case In Point, as well as online materials and resources (you’d be amazed at how valuable the websites of university consulting clubs can be). Obviously, our Consulting Case Bank is the ultimate in prep resources – you get access to 500+ cases you can practice by yourself or with a partner. Now, that’s a great deal! Run through them ideally with a consulting-interested friend, but if one isn’t available, practice by yourself. The key to good independent practice is to answer the question first, and THEN look at the real answer. Try to recognize patterns – is your answer always missing an analysis of the company’s internal situation? Do you always forget to discuss strategy in the context of competitors? Then make a mental note NOT to forget that. Then, practice with an expert. The feedback you receive will accelerate your prep, and focus your efforts. We have ~10 MBB coaches standing by to work with you this week. Simulate actual case interviews as much as you can. The timing is critical – both how long your answers are, and how much time you should spend asking questions versus providing responses. Ideally, you’d practice then with a consultant who has experience in this area. I’d even suggest getting a stopwatch, and looking at the length of your responses. If you’re over a minute, for 99% of answers – you’re too long. The timing piece is one of the main points of emphasis in our 1:1 coaching sessions. I will be uploading some very valuable, and free, case prep resources that I’ve managed to discover across the internet, and that kind readers have shared with me. Stay tuned! While some people think that the case can be 100% of the decision – and while this percentage will vary by firm and by office – generally the behavioral component is equally important. Especially because, at the end of the day, the vast majority of people will miss at least SOME part of the case – and when it comes to deciding between all of these people, what do you think the interviewers will base their decision on? Resume. Personality. It helps with networking. If they’re impressed with you, they will be self-motivated to send a strong recommendation to HR. They may put you in touch with other consultants for more practice and advice. Etc. It helps with industry and job familiarization. The more you know about the job, the lingo, the challenges, the pros and cons – the better you will do in the behavioral interview. And the more that you hear about REAL cases and REAL problems, the more you’ll understand about the case interview – and what consultants are truly looking for in responses (hint, it’s all about things that will really move the needle). It helps you personally. Many people get into consulting for the wrong reasons, which is a post in and of itself, but meeting consultants will give you a great feel for the types of people you’ll work with, their personalities, and help you make a decision about whether it’s the right path for you. 3) Practice in front of a mirror and with experts. Each has its own benefits. The mirror allows you to fix awkward facial expressions, poor body language, etc. The expert gives you live feedback and is closer to the actual interview dynamic. Volume and pace are important – don’t talk too fast (it’s natural when you’re nervous) and don’t compensate by speaking too loudly. 4) DRESS NICELY. Wrinkled shirts = do not think ahead = unable to plan workstreams = poor team member. Misshapen tie-knot = lack of friends able to do you a favor = poor social skills = poor team member. Dress nicely for men typically means a suit with tie and clean dress shoes. Same expectations for women. No cologne for men and very, very light perfume for women. EXTRA CREDIT if you wear brands that are most closely in line with the firm’s popular dress labels. Some of you may think I’m taking this too far, but ignore the jobless naysayers. For consulting, Brooks Brothers is a great bet. Half the consultants wear it. At the very least, you’ll show up looking professional. It can’t hurt. 5) Do not OVERDRESS. Had a colleague who went to investment banking interviews in an extra-long European-style suit, with a vest and loud tie. It screamed fashion guru, not banking analyst. Wear standard, muted colors – gray, white, and light shades of blue are your friend. Some may think that standing out is a good thing – but don’t push the envelope too far. Ask me if it’s appropriate. 6) Scan the news in the morning. Business consultants (read: your target audience) are very well read on the latest business news, and have a more than cursory understanding of politics and international affairs as well. At the very least, know the key issues of the moment. For example, you’ll look idiotic if you go into an interview today without being able to talk about Brexit or international trade for a minute or two. 9) Project great energy. This one is HUGE. I. Cannot. Underestimate. Its. Importance. Most interviewees are nervous, shy, and stone-faced. Would you want to spend upwards of 12 hours a day in a tiny room with someone like that? I think not. You’d want to spend those 12 hours with a person who is upbeat, enthusiastic, cheerful, and has great energy. It’s important not to overdo this, of course – but from my experience that’s not the problem most candidates encounter. How do you do this? Simple – smile a lot. Project when you communicate. Use hand gestures and display great presentation skills. Maintain eye contact, and lean forward just slightly. Laugh a little – at yourself, at a joke – to help you (and the interviewer) relax. Even the most experienced interviewers can be a little tense when asking questions, and realize that they’re in the same boat. Help calm the situation for both of you, and you’ll be way ahead in the game. What’s been the most difficult client issue you’ve faced? Do you consider post-[insert current job here] options and if so, what are they? If I got this job, what advice could you give me to help me get off to a fast start? If I were interested in (insert industry, geography, function here), how could I really get experience in that area? What would you say are the most common mistakes that new hires make? Which project has been the most (challenging/exciting/engaging) for you? There is a lot more DURING THE INTERVIEW content that I will write about in later posts. All business consulting firms have a FIT INTERVIEW (e.g., do you have the right personality traits to be successful at our company) and in consulting, there is also the CASE INTERVIEW(e.g., can you solve problems that are CliffsNotes versions of our actual job). 11) Ask for a business card, ask if you can email them with followup questions, and then ACTUALLY FOLLOW-UP. I’ve found that especially in consulting and corporate (less so in finance), people are eager to talk to you and are typically accessible. Ask them for FEEDBACK. Thank them for their TIME. Ask them to point you to others who have more expertise in a particular topic of interest to you (for example, if you’re really interested in non-profit consulting, ask them to point you to someone who could speak to that firm’s non-profit consulting opportunities). This keeps the interviewer engaged with you, and leaves an impression of someone who’s both interested and proactive. Two qualities that definitely HELP in landing a job. 12) Ask your interviewer to give you DETAILED FEEDBACK. Why? Because this feedback – both the pros/cons, strengths/weaknesses – will influence the style and content of your future interviews. If your first interviewer mentions that you had no problems with the fit/personality questions but really struggled with the market sizing calculations, you can bet that the second interviewer will focus on your quantitative chops. Readers often ask whether you can ask for feedback if you don’t pass the first round. This is typically rare, unless you established a good connection with your first round interviewer. Why? The simple answer is time. There are too many first round interviews, and needing to provide feedback for each would require an enormous undertaking. This is why I highly recommend that you ask for some feedback right after the interview, while you’re still in the same room and the experience is fresh. 9 times out of 10, your interviewer will be happy to help. 13) Remember a few INTERESTING FACTS from your interview. Facts like the interviewer’s name, office, background. Facts like the conclusion of your particular case study, or the setup for a tricky brainteaser. Why? Because when you get your second round interview, it’s GREAT to bring up those facts with your interviewer. Not only is there a chance that they’ll know the first round interviewer, but discussing these things make you look sharper and more familiar with the firm. 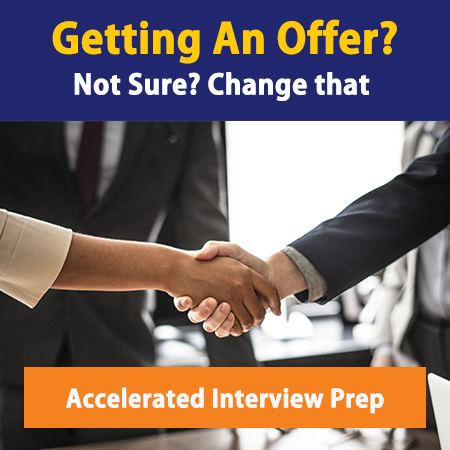 Establishing a connection with your interviewer OUTSIDE OF THE INTERVIEW ITSELF is a KEY DIFFERENTIATOR in helping you land the offer.